Ellen Kuzwayo, who has died aged 91 from complications from diabetes, was a stalwart campaigner against apartheid in <?xml:namespace prefix = st1 ns = "urn:schemas-microsoft-com:office:smarttags" />South Africa and a tireless fighter for women's emancipation. Popularly known as "Ma K", she was a teacher, social worker, community leader and mentor to many. In 1994, at 79, she was elected as an ANC member of South Africa's first multiracial parliament. Kuzwayo came from a family with strong ANC ties; as a young woman, she used to carry her father's bag at annual conferences. In the 1940s, she joined the likes of Nelson Mandela, Walter Sisulu and Oliver Tambo in forming the militant ANC Youth League, and served as its secretary. The organisation later transformed into Umkhonto we Sizwe (Spear of The Nation), the guerrilla faction of the ANC. Kuzwayo was present in 1936 when Mina Soga moved a motion to found the National Council of African Women. Kuzwayo was born into a privileged black family on a farm in the Thaba Nchu district of what was then the Orange Free State. Her father, Philip Merafe, was a prominent Sowetan businessman and ANC activist; her maternal grandfather, Jeremiah Makgothi, had been a leading member of the South African Native National Congress, a precursor of the ANC. As a child, Kuzwayo had not, she said, experienced white oppression. But after her mother died and the farm was seized and allocated to white farmers, she found herself in an uncertain and menacing world. She was educated at St Francis' College, and trained as a teacher at Lovedale College, Fort Hare, graduating in 1936 with the highest teacher training qualification then available to a black person. She gave up teaching in 1952 when the Nationalist government introduced the Bantu Education Act, which cut back opportunities for black education. Kuzwayo said she did not have the strength or courage to teach her pupils "what appeared to be very poisonous to their minds". Now a mother, she returned to higher education to train as a social worker at the Jan Hofmeyr School of Social Work, where she shared a bench with fellow student Winnie Mandela. She refused to work with government agencies, collaborating instead with voluntary organisations such as the YWCA, where she worked with women in deprived communities in the Transvaal. She was at the forefront of a campaign against infant mortality, and promoted cottage industries. Her first brush with the South African security forces came in 1977, following the 1976 Soweto uprising. 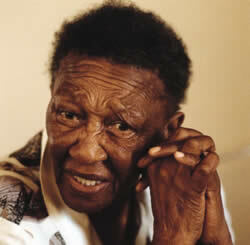 The only woman on the Committee of Ten, set up to organise civic affairs in Soweto, she led the campaign to force the apartheid government to introduce a form of land ownership that would encourage private sector funding into housing in the township. For her efforts, she was detained for five months under the Prevention of Terrorism Act. Much later, she described her pre-dawn arrest as she hid in the bathroom while police horses trampled her yard. She later became a consultant to the Zamani Soweto Sisters Council, the umbrella organisation of the township women's self-help groups. If Kuzwayo's political life was turbulent, so too was her marital life. In her autobiography, Call Me Woman (1985), she recalled years of abuse by her first husband. When she finally fled her marital home, she had to leave her two sons behind. She acted as a shebeen queen, alongside Sidney Poitier, in the film Cry, the Beloved Country (1951). She later re-married. Kuzwayo became the first black writer to win South Africa's leading CNA literary prize. Her second book, Sit Down and Listen (1990), was a collection of short stories in which she took the role of oral storyteller to keep alive the African cultural heritage. The stories highlighted the value of traditions and attitudes, and the plight of women caught between the old and new South Africa. Her film, Tshiamelo - A Place of Goodness, documented her family's story and the dispossession of their farmland. Kuzwayo was honoured by the Johannesburg city council and, in the 1980s, became the first black woman to receive an honorary degree from the University of the Witwatersrand. She retired as an MP after five years in 1999, when Nelson Mandela gave her an Order of Meritorious Service. She is survived by the sons of her first marriage. · Nnoseng Ellen Kate Kuzwayo, writer, campaigner and politician, born June 29 1914; died April 19 2006. Shola Adenekan publishes The New Black Magazine.